This paper aims to compare and contrast the measurement of efficiency in manufacturing and in well operations. Initially it would seem that the production of millions of widgets in a factory environment is incomparable with the drilling of a well that might take 3 months. The paper posits that on closer inspection the two processes are not very different. Multi-level OEE, debottlenecking and Continuous Improvement. 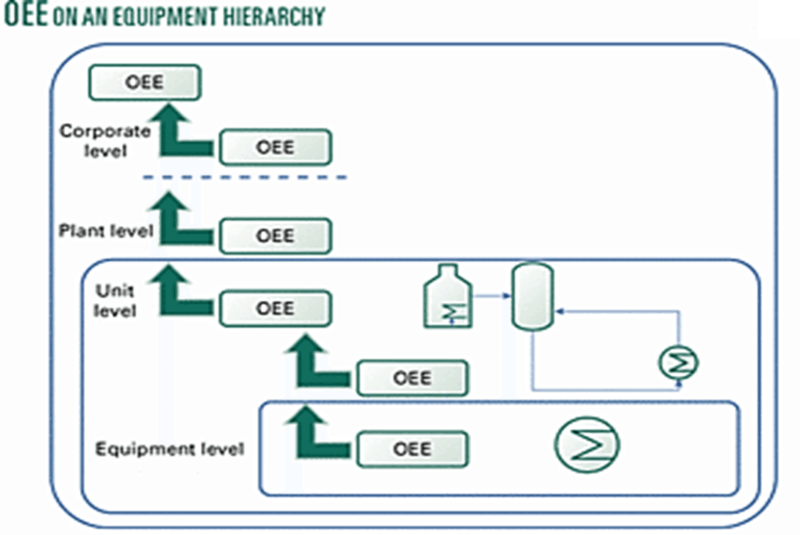 OEE can be used at multiple levels in an organisation, right from a single piece of equipment up plant or corporate level. The most important point here is identifying bottlenecks. 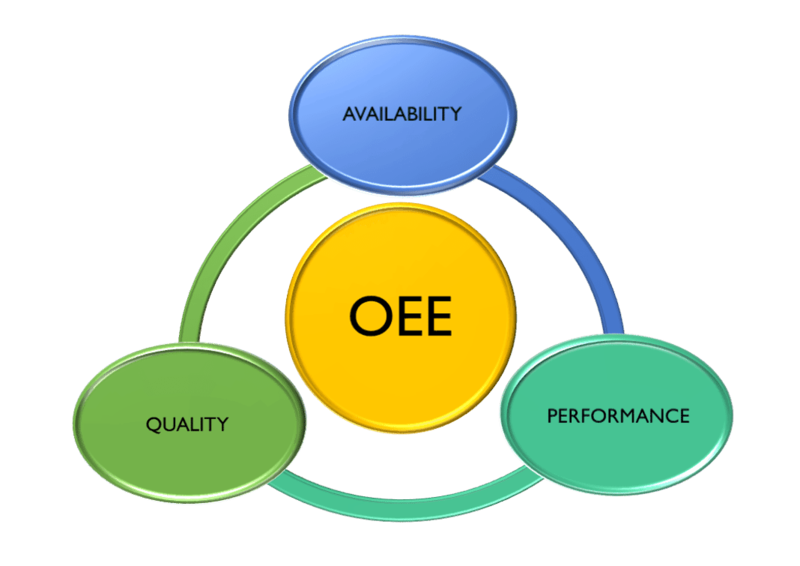 By examining OEE (in its constituent components A, P & Q) at multiple levels in an organisation it is relatively easy to identify bottlenecks. This allows the bottlenecks to be removed in an sequential manner and so becomes an essential tool when prioritising the use of scarce resources. However, as soon as a bottle neck is removed another bottleneck will become visible. You will never remove all the bottlenecks but the progressive removal over days, months and years is what underpins the concept. Non Productive Time (NPT) = Availablity. These two definitions map directly onto each other and are the same. The only difference is that Availability is measured in %, NPT is measured in time but often reported as %-age of total time. OEE and NPT are usually based on calendar time. 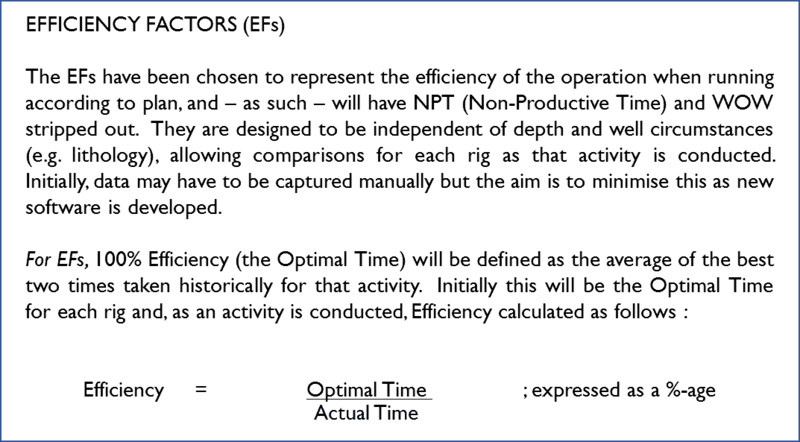 It is important to start from this point, however depending on what is being done with the data some categories of delay are removed. e.g shutdowns for annual holidays and waiting on weather (WOW). If you don't start from 24/7/365 it makes comparison difficult. A core concept of OEE and Lean is that everything can be improved. It also makes it more difficult to compare across different rigs/operations. One rig may stop when wind is 40 knots another when wind is 50 knots. Of course during anaylysis a relevant data set is extracted. thus if the across-well performance is to be analysed then WOW is removed due to seasonal variations. Equally this concept also allows nesting to be managed. Nesting is where the process has deviated off the original path, for example stuck pipe. We still want to ensure that the stuck pick is still freed as efficiently as possible. The total period from the pipe sticking until normal drilling recommences is recorded as NPT. The tasks required to free the stuck pipe are standard procedures that have their own planned and actual times. This allows the dataset just for the stuck pipe to be analysed on its own. Invisible Lost Time = Performance. At first sight the two definitions are the same. See definition at http://my-spread.com/files/4731pdf. Again the only difference is the use of time dimension. The Technical Limit time is defined as 100% performance. In the article above this would be 8 hours to test the BOP. Testing the BOP in 11 hours would equate to a 72.7% performance. Both OEE and Technical Limit rely on identifying the best observed time or the standard time to complete a task. Without this set of standard times both systems completely fail. Taylor (Appendix 1) has previously defined Efficiency Factor = Optimal Time/Actual Time. See Efficiency Factors are measured in % and thus are dimensionless. Optimal time has NPT and Waiting on Weather (WOW) striped out. Thus Efficiency Factors = Performance. 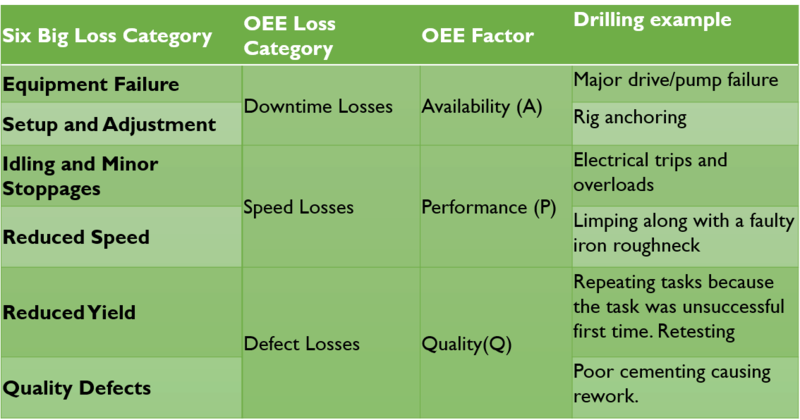 ​Above Availability and Performance are explained and contrasted in drilling and manufacturing, however Quality/Defect Losses appears not to be used in well construction. The key success lies in making all the processes as repeatable as possible. The challenge for Manufacturing in the past 20 years has been to move to mass, customisable manufacture. So whilst no two cars or coils of steel are identical, the process to manufacture them is comprised of hundreds or thousands or components or sub processes (drilling, heating, cutting etc.) which are identified and repeatable. These components or sub processes are simply arranged differently to produce a unique car or coil of steel. In drilling, each well is also unique, the product is a constructed well. However, with the possible exceptions of rank wild-cat wells (with no nearby formation information to go on), there are almost no uniquely new components and sub processes together. Each of the components or sub processes can be defined and the time to construct or build is known. This is particularly true for flat times and/or any times that they are independent of formation type. The drilling programme assembles and defines the well as a set of components and sub processes. The challenge appears to be agreeing and assembling the standard times. These standard times are coming from many sources and in different formats. However, ultimately the data is either manually collected or is collected by a PLC. In manufacturing, the factory is more static and the contractual relationship usually simpler. The Operator controls the PLC's and the labour resource and thus has much greater control over gathering and analyzing data. On a rig this is different, the relationship is usually more temporary and thus the investment in building and maintaining one system and team of people is too great, unless it is measured over a much longer timescale. The ROI on a factory installation will be years, in drilling it can often be a single well. ​We have explained the definitions used in OEE for manufacturing and NPT and ILT in Well Construction. We have shown where the definitions are easily to compare and where it's more difficult. Whilst designing a well, the Drilling Engineer's task is to construct a set of components into a unique set of sequences as defined by Engineering design and to generate a drilling programme. Almost none of these tasks are new and the benchmark or Technical Limit time will be known by someone, somewhere. However this process will usually have been manual and will have been at a much higher level than in a manufacturing process. It will be heavily reliant one excel and not a data warehouse that has been perfected over years. This is principally because the data comes from many different sources and is input/interpreted by different individuals - each of which is often different on every well. This will lead to variability in the quality of the 'standard' or Technical Limit times for each task. The people involved in operations will also have different views on how long each task will take - whereas in a factory the people are usually long-term employees and the culture will have reached consensus as to how long it takes to complete a task. If is often said that manufacturing has much faster Cycle Times than drilling. After all you typically turn out millions of widgets or at least hundreds of thousands of cars but typically a well will take 60​-90 days to drill, so you do 4-6 in a year. However it should be pointed out that drilling a well is not a unit of cycle and actually neither is a car. The unit of cycle that determines the 'learnability' is much smaller and has a much shorter time span. A unit of cycle in drilling might be the act of adding a further drill pipe to the string. These tasks are highly repeatable and bear a direct relationship to the act of adding, say, the light fitting to a car as it goes down the production line. In a year you are repeating the pipe cycles tens or hundreds of thousands of times. The reason for taking the 'best two' historical times is that this gives a gradual raising of the bar.